There’s something really satisfying about buying a whole car – something for which someone once probably took a loan, and on which they made payments – for the price of something like, say, a domestic airfare or a TV. Yet if you set your expectations correctly, you can definitely do this, and if you’re lucky, you can even find something less bland than your neighbor’s old ’87 Tercel EZ with 234,000 miles. Of course, it may just be that the thing making the car less bland is just a gimmick, but hey, when you’re dealing with 3-digit prices you’ll get your money’s worth after only a few weeks! 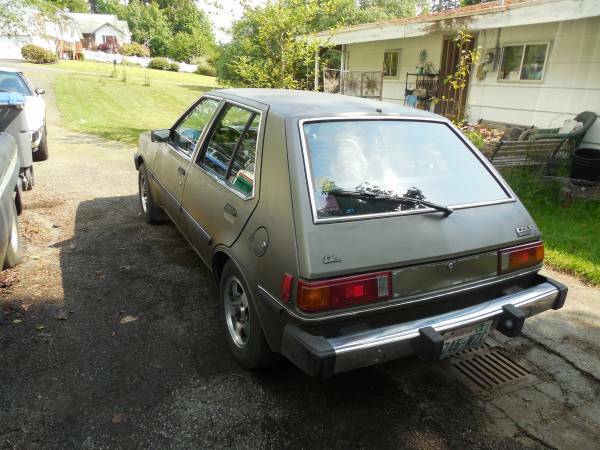 Check out this 1984 Dodge Colt DL for sale for $499 in Port Orchard, WA. Hmm. Looks like a contemporary Civic or Mazda GLC from this angle, which isn’t saying a lot. The paint’s faded but likely original (based on those klassy pinstripes probably installed by the dealer), all the trim is there, and there are no dents. Is that a Rambler in the background? Might just be interesting meeting the seller – what oddball is behind those garage doors? It’s not pictured, but presumably this car has an engine, and since this car is a manual, it’s likely the 64hp 1.4-liter engine. That said, the seller does say it’s an MCA Jet engine, which in the US market suggests the 1.6-liter with a mind-blowing 72hp. Either way, you’ll be glad of the manual shift to make the most of what it’s got, and hopefully the ample number of speeds will give you good acceleration, top speed, and fuel economy – why bother with the costly Colt GTS? 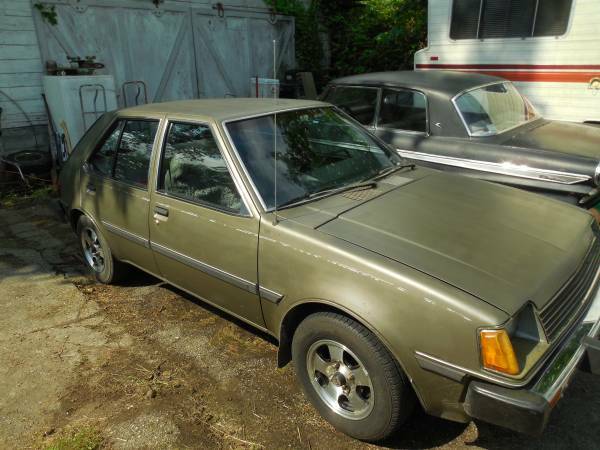 As for the looks from this angle, sure, they’re generic early-80s Japanese (would you say shortened Celica liftback? ), but for a 31-year-old econobox it’s in pretty good condition. Most critically, it’s said to run, and to benefit from a new fuel pump. And here it is – the wondrous invention which needs to amuse you for at least one month. Just think, you can test your coordination by shifting up into second-reverse gear, see how fast she’ll go in 8th, and still show that jerk in the ’82 Civic at the stoplight drags – it’ll probably be harder finding an ’82 Civic, or explaining to the driver why you’re gunning your engine. 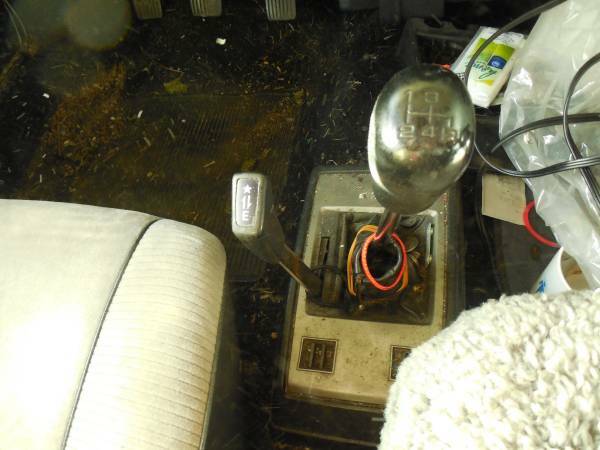 Just a little vacuum, spit, and polish, and when you’re done with the 8-speed you can sell it for $750 at the next Japanese classic car show! This entry was posted on June 28, 2015 at 1:09 pm and is filed under Feature. You can follow any responses to this entry through the RSS 2.0 feed. You can leave a response, or trackback from your own site. I want it. I’m just too far away and bought another freak car though (Ford Taurus MT-5). According to fueleconomy.gov, this car was rated at 37/48 when new. Who has it and how can I contact the seller?